In Man and Woman, One in Christ, New Testament scholar Philip Barton Payne condenses over three decades of research committed to the trustworthiness of Scripture to elucidate Paul's teachings on this controversial topic. The author's exegetical examination is thorough, exploring the influences on Paul, his life as a church leader, and his instructions to various Christian communities. Paul's theology, teaching, and practice consistently affirm the equal standing of men and women. This has far-reaching practical implications for the church and society today. This rigorous analysis of Paul's statements regarding women offers fresh perspective - and in some cases, needed correction - to the discussion of Paul's principles regarding women, their standing, and their ministries in the church and home. 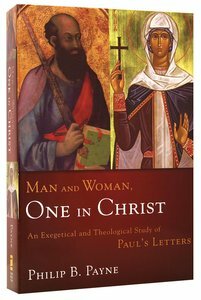 Man and Woman, One in Christ is required reading for all who desire to understand the meaning of Paul's statements regarding women and their relevance for Christian relationships and ministry today. About "Man and Woman: One in Christ"
Does Paul teach a hierarchy of authority of man over woman, or does he teach the full equality of man and woman in the church and home? In Man and Woman, One in Christ, Philip Barton Payne answers this question and more, injecting crucial insights into the discussion of Paul's view of women. Condensing over three decades of research on this topic, Payne's rigorous exegetical analysis demonstrates the consistency of Paul's message on this topic and its coherence with the rest of his theology. Payne's exegetical examination of the Pauline corpus is thorough, exploring the influences on Paul, his practice as a church leader, and his teachings to various Christian communities. Paul's theology, instruction, and practice consistently affirm the equal standing of men and women, with profound implications for the church today. Man and Woman, One in Christ is required reading for all who desire to understand the meaning of Paul's statements regarding women and their relevance for Christian relationships and ministry today. This work has the potential of uniting the church on this contentious issue. Philip Barton Payne (Ph.D., University of Cambridge) is a specialist in New Testament studies. He is the founder and president of Linguist's Software, the creator of fonts for over 2,000 languages. He and his wife Nancy live in Edmonds, Washington, and have three children, David, Kimiko, and Brendan. He is the author of The Authentcity of the Parables; The Parables of Jesus and Man and Woman, One in Christ: An Exegetical and Theological Study of Paul's Letters.